Enjoy a refreshed atmosphere throughout every part of your home when you shop our selection of vinyl flooring in Turlock, CA. At Arrow Floor Covering, Inc., we feature a full variety of different products for spaces of all sizes. Whether you want to remodel your bedroom or entryway, you will find what you need when you visit our showroom. Our stock includes endless options that fit any style preference. 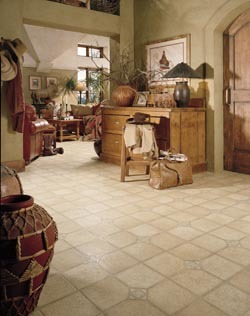 Visit us today to explore our collection of vinyl tile flooring for your home. If it has been many years since you last remodeled your home, you may find that you are ready for a change. Simply adding a new set of flooring can give you the bold new look you want without the need for a lengthy renovation project. At our local flooring showroom, we proudly feature endless options in vinyl. No matter what your personal design preferences are, you will find something you love when you visit our store. We are proud to feature styles that create a luxury look in every space. Whether you want to add the classic appearance of hardwood or the regal look of granite to your home, we have the right option for you since our vinyl flooring mimics the look of wood, stone, and other materials. Shop with us to discover how our products can breathe new life into your residence. Whether your home has children or pets, it is important to choose floors that will hold up to heavy foot traffic. Vinyl flooring offers homeowners a durable and strong option. This material is built to hold up to regular use without experiencing damage. When you choose these floors for your space, you will help avoid the need for expensive repairs in the future. After spending your time shopping for the perfect pattern for your space, count on our team to complete your project to the highest standard. For your convenience, we offer full vinyl flooring installation services for each of our customers. Whether you are upgrading your entryway or bedroom, we are here to perform your services. Don’t trust your installation to just anyone. Our experienced contractors are able to take on jobs of all sizes and complexities for every part of the home. We focus on the details to ensure that every plank or tile is placed properly. With our professionals on side, you can trust that your job is completed the right way the first time. Speak with us today to learn more about our vinyl flooring installation services. Contact us to shop our selection of vinyl flooring. Our products are available throughout Hilmar, Denair, Hughson, Oakdale, and Turlock, California.